It’s a beautiful morning — there’s not a cloud in the sky (and it’s become bright blue now), it’s crisp but not too cold (fine enough for an early-morning photo shoot), and Thursday’s snow still conceals the end-of-winter dullness. The deer have been by this morning, and the chickadees have been making themselves heard. Annabelle has had her Sunday morning tour of the bottom of the stairs (yes, my cat is weird), and I’m back inside to warm up and have another cup of coffee. I’m glad you could stop by! 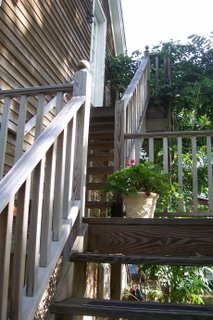 These are the stairs up to my apartment in a greener time of year (last September). I live in a sweet little place, which happens to be above the garage of my landlords’ house (they are the best in the world — D even shovels the snow off the stairs for me!). I’ve lived here for six years. Boy, does that sentence make me shiver. I’ve rarely lived in one house for six years! Does that mean I’ve settled here? This is for Becky’s virtual field trip, by the way. Check out her sidebar and join us! 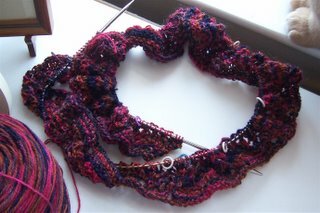 My lace scarf project is not the easy knitting I’d hoped. It’s not that it’s difficult, really, but that it requires my attention at all times. You lose one yarn-over, and there goes your evening. Here it is, in all its 293 stitches of rumpled glory, with cat toes for scale. It’s not much to look at yet, is it? I’m also knitting away on the second sock for that R. I’ll finish the pair this week, and I’ll finally have something new to report to Amie’s 2000Socks count. Have you seen that ticker on her blog? It’s at 1026 socks, and it’s barely March! It’s time to get on with this beautiful day. It will involve a road trip to Target for supplies (cat toes must be fed), but I’m planning to visit a lot of back yards, too! What a lovely backyard view! Thanks for sharing it – today is gray & snow is on the way & the landlord’s dog has torn up my backyard so it wouldn’t make for a nice picture today. Your lace project is coming along nicely. 🙂 Enjoy your day! What a nice view! It’s great that you have some wildlife right there! G’ morning Jane – wish I was there sipping coffee with you too. Your artistic eye for photos is so wonderful.! Even rumpled lace is beautiful! 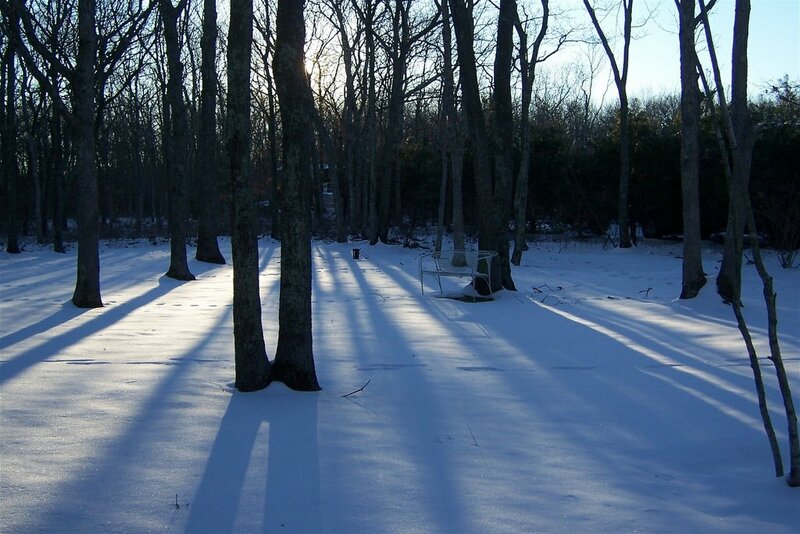 :)Your backyard is wonderful with it’s sun rising through the trees and snow everywhere. I bet it’s great out there in the green of summer!Have fun at Target!heh. “cat toes”! Dont you just love how the snow makes everything new again? That photo of your view is priceless. Thank you so much for posting it.I’m planning on hosting a new fieldtrip each month so if you want I hope you’ll check and see what next months theme will be.Enjoy your Sunday! Your rumpled lace looks lovely, as do the little cat toes. Love the colours and movement in the knitting. The snow looks beautiful and fresh and clean… I may have to retract my statements about being glad I don’t live back east anymore. very pretty ;o) I love the blue of the shadows there. Isn’t amazing how beautiful snow can be. Your picture this morning is outstanding. Your lace project is coming along nicely as well. Beautiful! I love the very blue sky in the first pic.Great progress on the scarf–looks nice. So pretty! I love the tree shadows. I love the photos you posted, especially the first one creates a very special atmosphere!Your scarf is coming along so well, I can’t wait to see the photos when it’s finished!Have fun knitting, and best wishes from Austria! I wish I had seen your blog in time to take a picture on Sunday! I love the snow and trees – most of our snow is gone now, but is was beautiful while it was here. We won’t see snow again this winter, but I can enjoy yours. Thank you for such pretty pictures. I’d love to sip a cup of tea in your back yard. I love that tree picture – all shades of blue/gray/white – lovely! Cat toes are pretty darn cute as well. Nothing like some help, eh?